The very comfortable Academy Hotel is the ideal choice for the visitor. 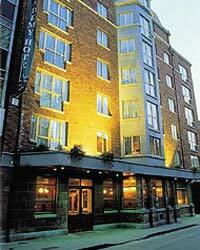 The hotel is located just off O Connell Street in the heart of Dublin’s City Centre. The staff are well known for their friendliness, hospitality and attention to detail. Dublin is a vibrant cosmopolitan city with a buzzing night life and a million and one things to do. The management and staff are always willing to assist the guest in getting the most out of their visit. The 98 fashionable en suite rooms and suites in The Academy Hotel are fitted with air conditioning, satellite televisions, direct dial telephones, modem points, linen pressing facilities, tea and coffee making facilities and a safe. The rooms and suites are furnished to ensure peaceful sleep. The hotel also offers five specially adapted rooms for guests with special needs. The Fadó Fadó bar is a traditionally Irish bar loved by visitors and Dubliners alike. The Bar offers a fine food service each weekday including lunch and snacks throughout the day. The Oscar's restaurant in The Academy Hotel offers both traditional meals and international cuisine all cooked to the highest standards by highly trained chefs. Findlater Place just off O'Connell Street is home to The Academy Hotel. It is an ideal location for shopping and sightseeing in this fine city. Henry Street and all its shops is just a step away. The hotel is also within five minutes walking distance of Grafton Street shopping and the flamboyant night life in Temple Bar.